Deer are cute, aren’t they? 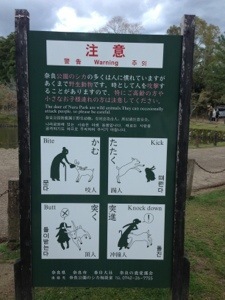 Well, I always thought they are until a couple of days ago when I visited Nara. My family is here for a visit after my recent move to Osaka so I guided them around traveling in Kansai area and visited Nara (奈良）the other day. This is my first time in Nara. 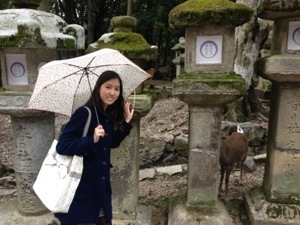 We went to Nara park and some famous old temples around. Nara is also a famous tourist spot since it used to be Japan’s capital in the past similar to Kyoto in which it has a great glorious history. 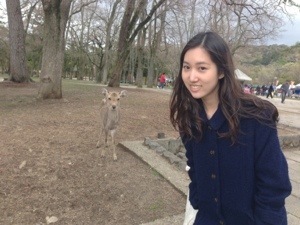 It is also famous for wild deer! As I was in the park, I could see that the deer’s antlers are cut off to prevent them from attacking people (in some certain level anyway). 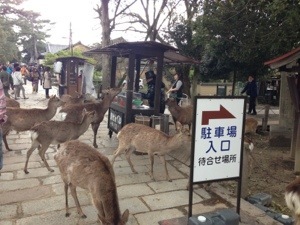 This is a senbei stall where people can buy deer food. Look how hungry they are! That’s the closest I would go close to a deer. Some deer can also be shy. It was a fun experience walking in a park full of deer. So much nature! I loved it. A must-visit place if you pass by kansai area. Whoo these deers are wild ! Yes, they wouldn’t wait. Gotta be real careful! Oh! I have deer coming through my backyard all of the time. I didn’t know deer would ever be so bold as to bite someone. I guess if they got hungry enough……. 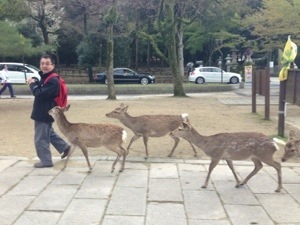 These deer know they will get snacks and they are not afraid of people at all!